You must make reservations at least 5 minutes in advance of the time at Collage Restaurant. Parking in St. Augustine can be challenging on busy nights. Please allow extra time to find a parking space before your reservation. and veal, using international flavor profiles. 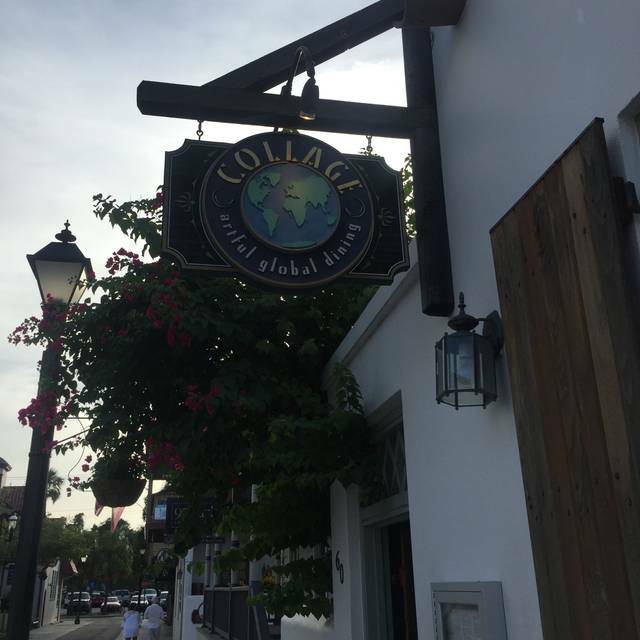 Located just a block off of St. George Street in the heart of the historic district, Collage serves dinner nightly from 5:00 p.m. Unfortunately, we do not accept parties of 5+ online. Please note we are just a small 15 table restaurant. Thank you for your understanding. Please reach out with any questions. Without a doubt the finest restaurant in St Augustine. Kasha our server was incredible. Very Professional so kind. We are locals who live in Palencia and always come to the Collage for special occasions.It was my 64th Birthday and what a great place to celebrate. My husband and I ate here on our last night in St. Augustine. The food was wonderful! 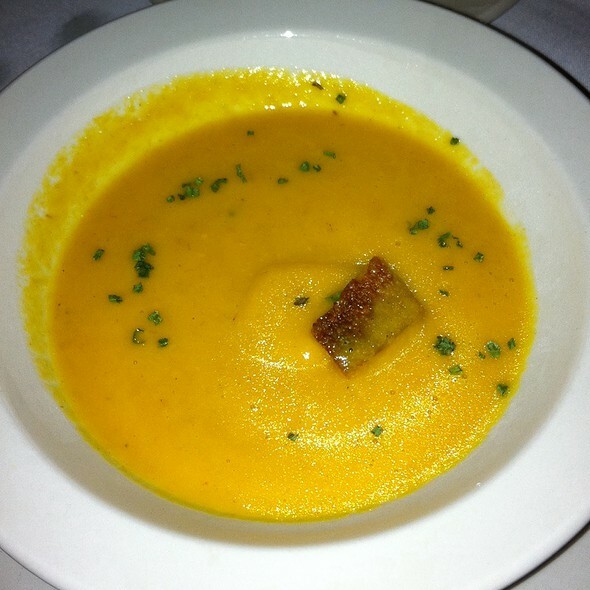 However, the restaurant was dark and true to the period, but I enjoy a restaurant that is lighter and airier. We were celebrating our anniversary and had a table in front of fireplace. This is a small restaurant with two rooms. The food was delicious. 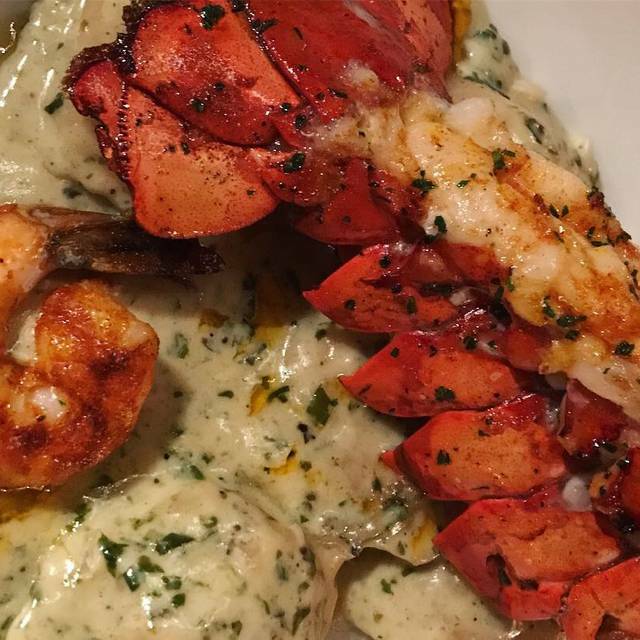 We had the lobster ravioli with lobster tail and lamb chops eith mashed potatoes and veggies. Our waitress Jessica was attentive and sweet. Expect a very enjoyable evening. One of our favorites!! 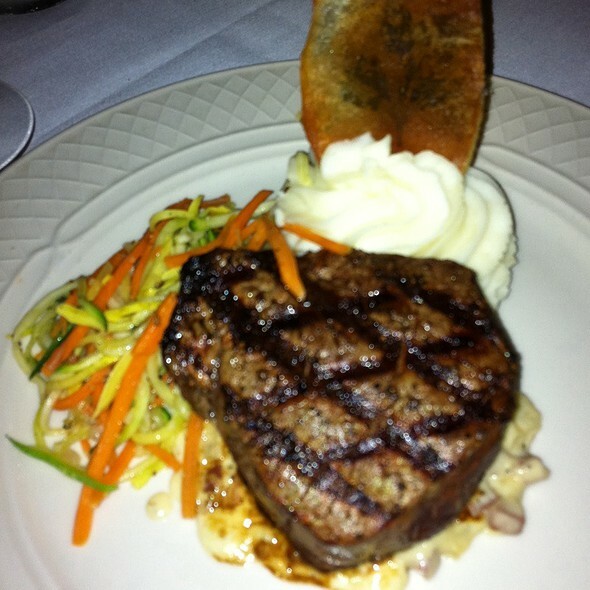 Food, service, and atmosphere are excellent. We love the consistency of The Collage and feel it is one of the best dining spots in St Augustine. Away from the crowds and noise, it’s a refreshing quiet place for an enjoyable dinner. Reasonable prices, great service, good food, nice atmosphere. That’s all you need. Just a lovely night. 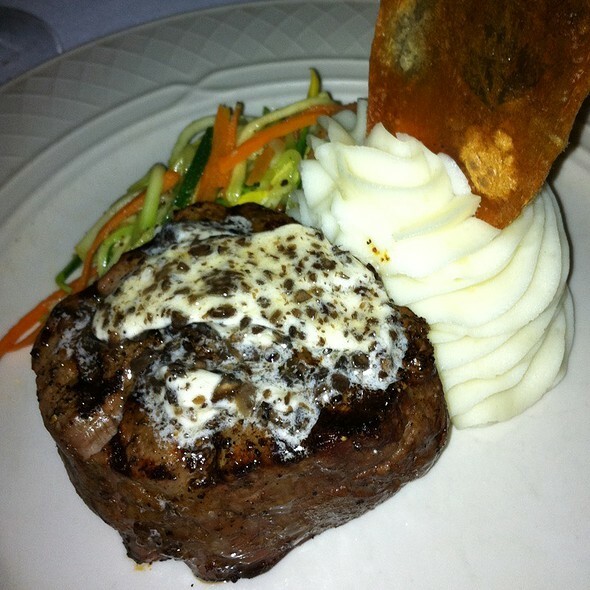 Food was exceptional, and the service attentive and terrific. It was a lovely fine dining experience. Amazing food and service - small historic building so not much space. It was amazing! Brought my husband for his birthday and they did not disappoint! We absolutely loved this place! We will be back for sure! This is our favorite all-time restaurant! The food is excellent! The creativity and variety of the dishes is amazing! The service is amazing! 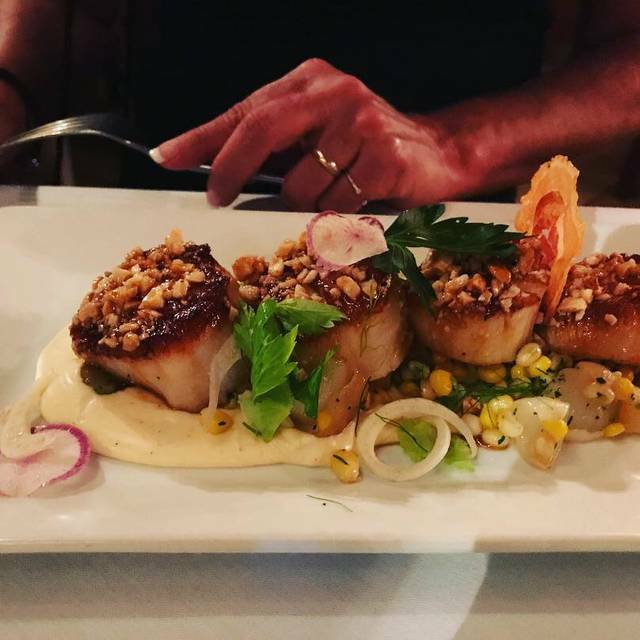 Collage is a superb fine dining restaurant in Saint Augustine, and one of the best in NE Florida (including Ponte Vedra and Jacksonville)! With a creative continental cuisine, a diverse wine selection, and the best service, Collage is truly a memorable dining experience that will always bring you back again. Lovely restaurant. Great service. The veal was amazingly tender and juicy. The warm goat cheese salad had a won’t texture but the dressing was a little too sweet and in need for some acidity. Same was with the scallops- cooked perfectly but too sweet for our taste. Wine was reasonably priced. Overall it was a very enjoyable experience. We highly recommend it. Never disappoints! It was fabulous.... the homemade Burrata appetizer was AMAZING! My husband had the duck and just loved it! Great wine list and excellent service. Great restaurant. I eat there every time I'm in st augustine. The food is excellent!!! If you go, you must ask for Scott. He's awesome. Extremely aware of his customers needs! Everything was great and made a perfect evening. Super good restaurant. Food was brilliant; service wonderful; presentation unique. Must go! Absolutely amazing restaurant! I can not rave about this place enough! 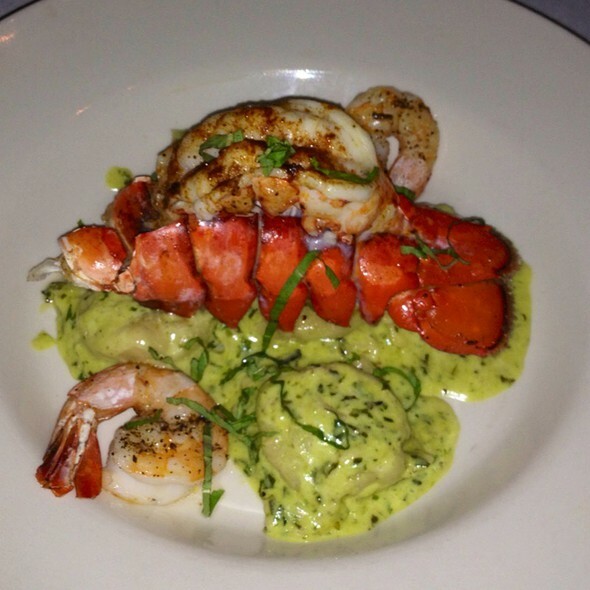 Excellent food, amazing service! Never disappoints. Food, service exceptional. As always, the food was delicious and prepared beautifully. Service was excellent. Food was delicious and staff was extremely nice and well prepared! It was our second visit to our favorite restaurant & we shared it with 2 friends who had never been. Everything was exquisite! They absolutely loved it as much as we love it!! We can’t wait to come back! Wonderful restaurant! Scott our waiter was attentive, knowledgeable and gave us great suggestions! The ambience was just perfect for my birthday celebration with my wife! Lovely, quaint restaurant with a great selection of wine and amazing food. Will be visiting the next time we are in town. Another great night at Collage, the best in St. Augustine. The food here is amazing! I have eaten here a few times and have had something new everytime and have never had a bad meal. The service is amazing! When it completely full, it can get kind of loud, but the atmosphere and ambiance is wonderful. Had a very nice dinner. 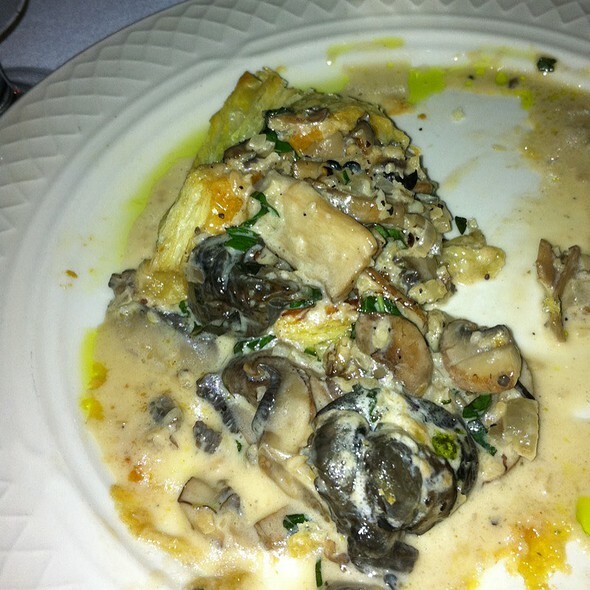 Food was excellent, ambiance was great, and service staff were very good. Small, tight, dark, nothing special. The shrimp appetizer was inedible as well as the mashed potatoes. The pork chop was bland, but the filet was very good along with the jasmine rice. Outstanding wine and dinner menu. Small quaint setting with ever-changing menu. Attentive staff that knows how to take care of their clients. 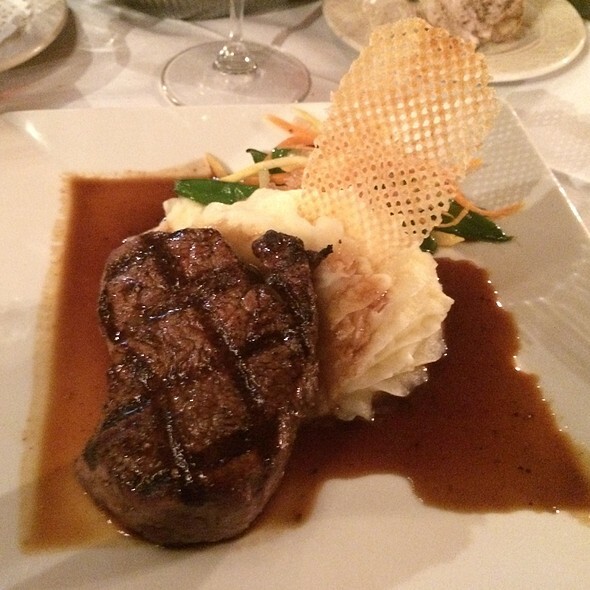 Excellent food and service in a very cozy and quaint setting. Definitely going back! By far, the best restaurant in St, Augustine! W,e loved the food and the atmosphere is terrific. Highly recommend it. We celebrated my sister-in-laws 50th Birthday here and it was perfect! The food was terrific. My wife had flounder and I had the appetizer and entree from the day's special menu. First time to St. Augustine and first time to Collage, it, the restaurant, was wonderful. The service and the food couldn't have been better. Husbands steak was mediocre. My lobster and shrimp both undercooked and I couldn’t eat it (also 5 months pregnant). My husband and I are both foodies and enjoy fine cuisine often. Both meals subpar compared to our many other experiences. We spent >$130 and I was so hungry afterward, we stopped at McDonalds on the way home to eat.